Get your warm blanket, cup of hot cocoa and a seat by the fireplace. Got everything? Great! 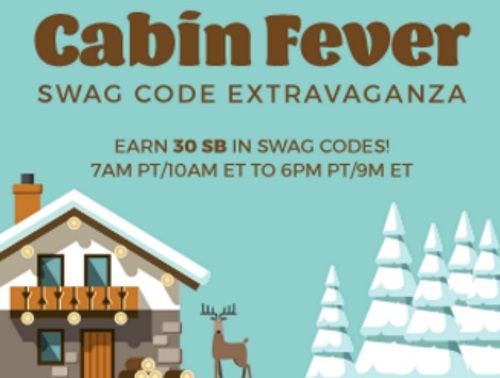 Get cozy and ready for the Swagbucks Cabin Fever Swag Code Extravaganza! Swagbucks once in a while does these special days with Swag codes posted throughout the day. There will be a total of 6 Swag Codes available, with a total of 30sb. They can be posted anywhere including the Swagbucks Facebook Page, twitter, other social media, on their blog etc. I will be posting the ones that I find here so check back throughout the day. They will be listed below. The Fever begins on Wednesday, January 25 at 7am PDT/10am EDT until 6pm PDT/9pm EDT. Click here to follow us on Twitter to see the Swag code updates when I post them. Not a member yet? Click here to sign up to be a Swagbucks member.